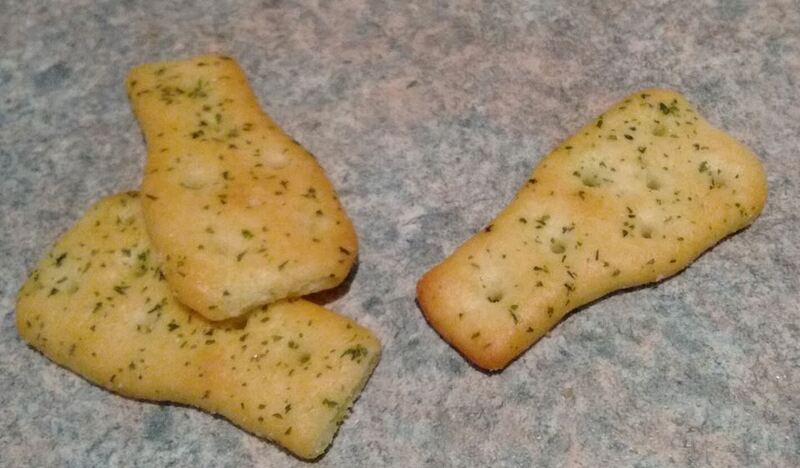 Another day, another savoury snack biscuit to try. These are Chicken Drumstick flavour, although they are unaccountably shaped like cola bottles. 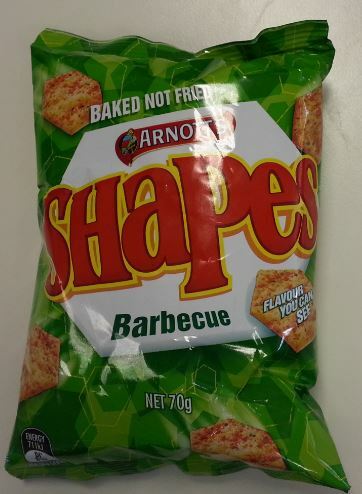 Arnott’s make quite a variety of Shapes, in all sorts of, erm shapes. And flavours – although many of the flavours kind of blur into each other. Truly I think if they switch round the packaging not that many people would notice – ‘chicken’ flavour tastes much like ‘BBQ’ flavour tastes much like ‘pizza’ flavour and so on. This makes for somewhat problematic reviewing. I mean, a strawberry Tim Tam is clearly quite a different beast to a mint one, so there’s plenty to say. But for these – well, it gets a bit harder. 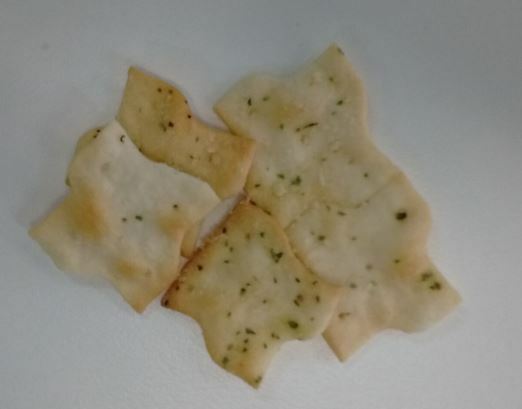 They are a savoury snack biscuit. They are too salty, taste rather artificial, and are very addictive. Oh, and they have flavour you can see. Whatever that means. 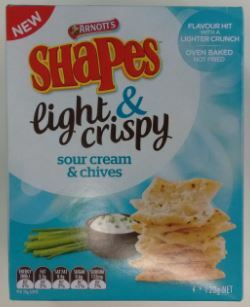 To be honest, I’d steer clear of the whole regular Shapes thing, and go with the ‘ Extreme‘ range (which actually aren’t ‘extreme’ at all, just more tasty). I’m going to give these a four out of ten. 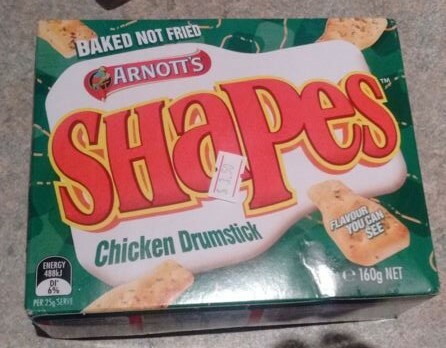 I wrote this post before I realised that Arnott’s had revamped their whole shapes line – to considerable controversy! Anyway, this review is now somewhat historical, as this is one of the flavours that was discontinued. I intend to come back to the Great Shapes Controversy very soon! Well, that was a surprise. I opened the kitchen cupboard to find something for the kids to eat, and discovered a new and hitherto unknown Arnott’s biscuit. Like that other scholarly biscuit in the Arnott’s range, these are evidently designed to assuage parental guilt about sugary kids snacks. Hey, they’re educational! They are also exclusive to Woolworths, I note. It seems this is a growing trend. I hope Arnott’s also make some biscuits ‘exclusive to small corner shops‘ and the like, rather than just our grocery behemoths. I think that would be nice. So what are Letter Jumbles? Well, they are small biscuits with letters on. They are actually tiny Milk Arrowroot, and seem to be exactly the same recipe as their larger brethren. 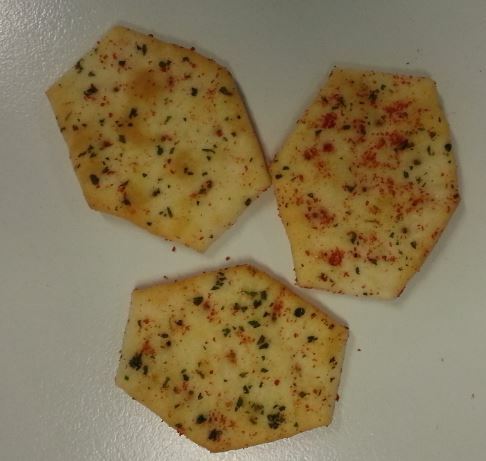 As well as being smaller, though, they are also a little bit thinner, which yields a slightly crunchier texture. I opened just one small packet for the junior Chillikebab’s to share, and it contained eight biscuits. Thankfully, it contained an ‘E’ and an “B’, so both the little darlings were both able to have the first letter from their name. I assume all the letters are equally represented, although this would take some significant research to verify. All in all not bad, but all that packaging for so few biscuits seems a bit over the top. Why can’t parents just buy a regular pack of Milk Arrowroots, and put one or two of them into a kids lunchbox, perhaps wrapped in a little twist of greaseproof paper? And for that matter, why don’t we still wear flat caps, and why do school children have to wear shoes, and why aren’t kids allowed to clean chimneys any more, at least on the weekends? I’m going to give these four out of ten. Bah Humbug. Is this a step too far, I wonder? 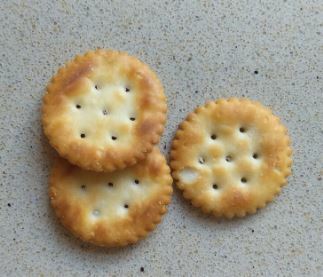 I have begged your indulgence to write about savoury biscuits, and you have responded magnificently,with an overwhelming response asking for cheesy reviews. But this? Sold in a bag, and clearly not meant for putting with a cheeseboard? Well, dear readers, let me know what you think as we step into the dangerous waters of the savoury snack biscuit. 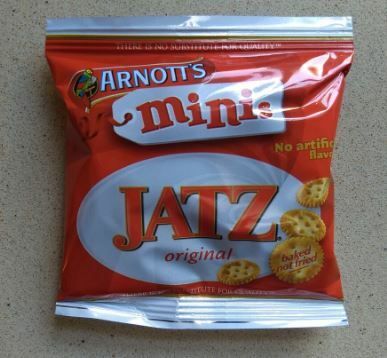 There are a number of things about these that Arnott’s are very keen you should know. Firstly, they are ‘baked not fried’. Well that’s alright then. Clearly slathering fat all over something and then putting it in the oven, rather than merely dipping it into hot oil is to be applauded. After all, potatoes baked in duck fat are practically a health food. The other thing is that they have ‘flavour you can see’. This seems strange to me. Personally I prefer flavour you can taste. Maybe it’ one of those post-modern things, like paintings you can hear. I looked at the flavour long and hard, but didn’t really get any hint of barbecue – more pencil shavings or bits from the dust-pan. Nothing to suggest burned sausages or parrafin lighter fluid. To eat, though, you do get some flavour. It seems the flavour is not just for looking at after all. The biscuit is crunchy and quite OK texture-wise. The flavour is of the generic ‘barbecue’ type, which is to say it really has very little to do with barbecues, and a whole lot to do with monosodium glutamate. Salty, spicy and slightly sweet tasting with a chemical edge that strips your tongue. Oh, and very addictive. The packet will be gone in a flash. Of course, they are terrible. Artificial, gimmicky and lacking all depth and subtlety, But, for all that, they do deliver on expectations for the genre. I’m going to give them a four out of ten. 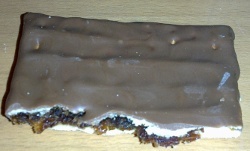 The Snack Right Sultana Fruit Slice. A biscuit that reminds us of Italian feats of derring do; of swashbuckling adventures on the high seas, a handsome hero entering into battle and overthrowing tyrannical monarchies, stealing the hearts of beautiful women along the way and being feted by society figures across the world. You don’t get all of that? Well, you should, as the Snack Right Sultana Fruit Slice is a Garibaldi biscuit, plain and simple. I don’t know why the Garibaldi name never caught on in Australia, but the combination of lots of sultanas squashed between two layers of soft biscuit is a classic, right down to the large slabs it comes in, with each slab being marked into five pieces for home disassembly. The strange thing about this biscuit is that Arnott’s make another very similar product, but one that is not marked as ‘Snack Right’. Kind of ‘Snack Wrong’, if you will. And indeed, the Snack Right product is the better of the two; juicier sultanas, a more structured, moreish biscuit and it seems better for you too. Go and grab a red cape and sword and give them a go. They are really rather good. I’m going to give these a nine out of ten. (And don’t miss the chocolate coated version either). 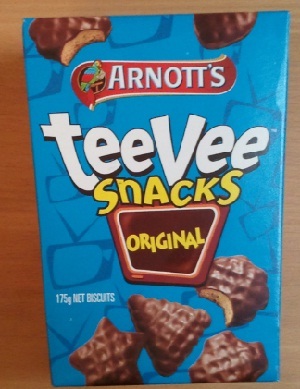 Today we look at the Original TeeVee snacks, as opposed to the wafer version we looked at previously. 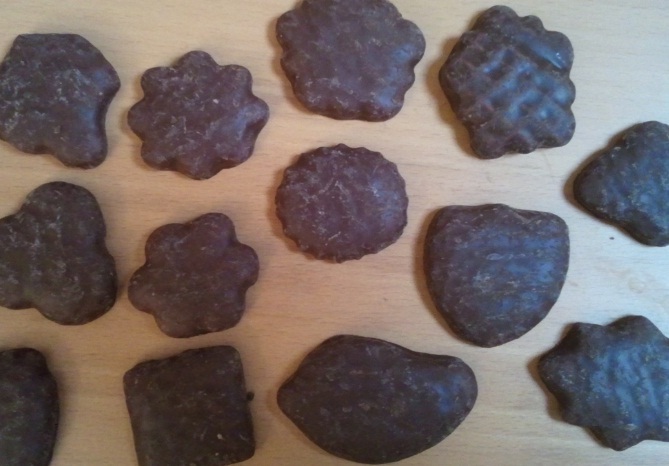 They consist of small, crunchy biscuits covered in milk chocolate. The major excitement is that each biscuit is a different shape; there are dozens of different ones that defied all my attempts at categorisation. I notice from the packet that the name ‘Tee Vee’ is trademarked. 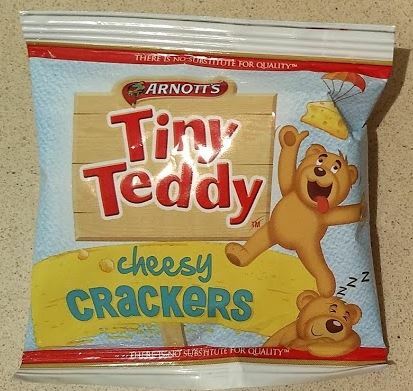 I wonder how far Arnott’s have gone to secure that trademark internationally; as it also appears to be the name of a Chinese manufacturing company that manufactures, amongst other things, beauty items, massagers and ‘battery operated items’. Hmmmm. I may never look at a TeeVee snack in the same way again. 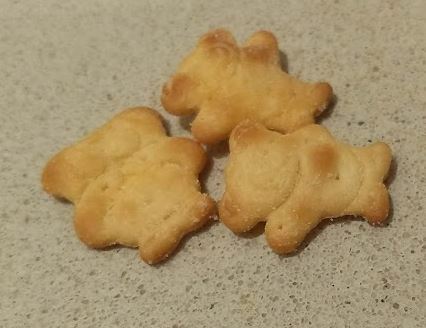 For all that, they are quite nice; the biscuit is nothing special but they are quite chompable, and I can see that they would go down well whilst watching a movie or something. I’m going to give these a solid seven out of ten.